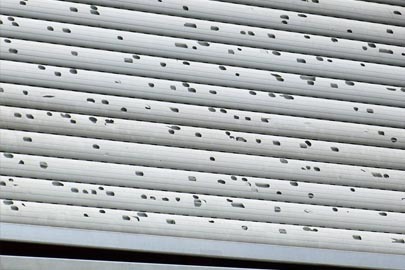 Hail Damage Repair Peoria, IL | Kelley Construction Contractors, Inc.
Property owners are often amazed to discover how much damage hail can do in a short period of time. But, once large chunks of ice start falling from the sky at high speeds, it’s your property’s roof and exterior that will pay the price. When these unforeseen emergencies strike, an experienced contractor can make all the difference in providing hail damage repairs. At Kelley Construction Contractors, Inc., we help our customers throughout Bloomington, Peoria, and Central Illinois to undo the damage caused by severe weather. This list of hail damage signs is just to get you started. It’s always important to have a contractor provide a full inspection to make sure your property’s roof and exterior is properly restored. When it comes to insurance coverage, you only have a limited time to report your hail damage, so if you notice any of the above, contact Kelley Construction Contractors, Inc. right away. Our siding crews can repair and replace all your hail damaged siding. 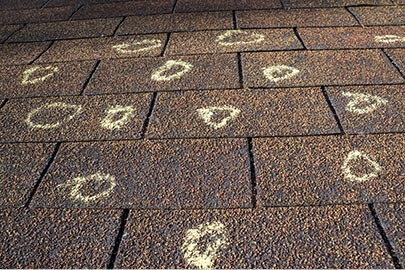 Our roofers can spot hail damage on your property’s roof. We can then repair or replace your roof to fix the hail damage. Let us take care of your hail damaged windows. Nothing is worse than hearing hail dent your roof and siding knowing there is nothing you can do to stop it. With each pelt, you are probably thinking about the costs associated. At Kelley Construction Contractors, Inc., we provide hail damage repair services that are affordable and will restore your roof and property’s exterior back to original condition. We can even help you through the entire insurance process. Our services always start with a hail damage inspection during which we will take a close look at your roof, siding, gutters, and decking to make sure we find all signs of hail damage. 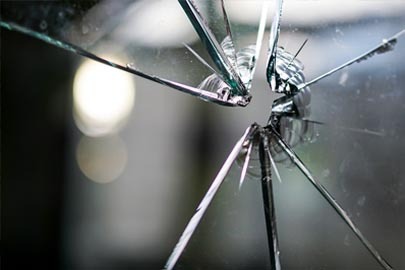 Our team can find even the most minuscule damages that may seem insignificant but should be reported regardless to make sure they don’t turn into something major. Once we have provided a total inspection, we will give you an estimate for the repair costs so you know exactly how it will affect your budget. Since your roof is the highest part of your property, oftentimes it sustains the most damage during a hailstorm. Kelley Construction Contractors, Inc. provides hail damage roof repairs that will restore the integrity of your roof and make sure it will safely protect you. A missing shingle may not seem like much, but leaving any amount of damage to your roof can be risky. Let the team at Kelley Construction Contractors, Inc. take care of your property by scheduling your hail damage roof repairs today. No matter where the hailstones fall on your property, chances are, the team at Kelley Construction Contractors, Inc. can fix it. We are your experienced hailstorm contractors that will do everything we can to restore your property as quickly and as affordable as possible. Hail-producing storms often appear unpredictably, leaving property owners with unexpected costs and headaches to contend with. When you work with the team at Kelley Construction Contractors, Inc., you get an experienced group who knows what it takes to restore your property quickly, affordably, and hassle-free. Contact us today for an estimate!